At first glance, design hotel Château de la Resle looks like one of the many typical castles in the French countryside, which we all see when driving through France. The intriguing mix of romance, architecture and authenticity has an extraordinary appeal. 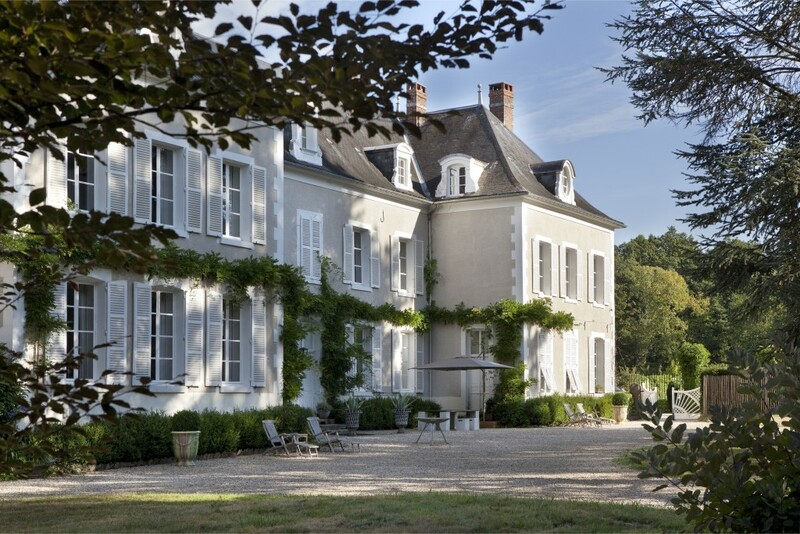 However, behind the walls of this chateau a remarkable design hotel lies hidden. And more: Chateau de la Resle is also the name of a new label for Dutch Design; with works of famous designers like Roderick Vos, Jeroen Wand and Kranen/Gille. The entire castle breathes art and design. Welcome to Burgundy, at Château de la Resle. 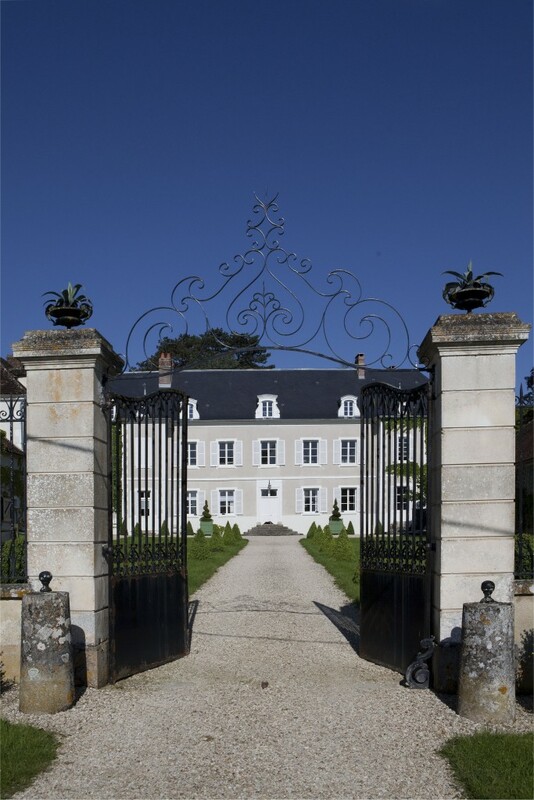 The buildings on the 6 hectare estate belonging to the Château date back to the 17th and 18th century. Thanks to a largescale, meticulously executed renovation the castle is totally ready for the 21st century. Those who pass its gates discover, behind its impressive facades, not only a remarkably luxurious Bed & Breakfast, but also a unique collection of contemporary art and Dutch Design. The lords of the manor Pieter Franssens (l) and Johan Bouman (r) have been the owners of Château de la Resle in Burgundy, close to Chablis, since 2005. 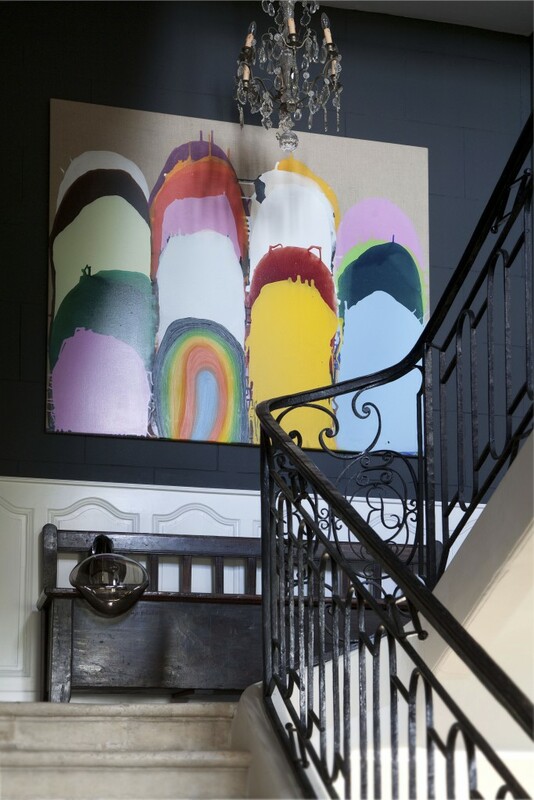 Johan Bouman: ‘Our extensive collection of contemporary art and limited design has become part of Château de la Resle. Because more so than collecting art in itself, our goal is to create a field of tension between art and castle. 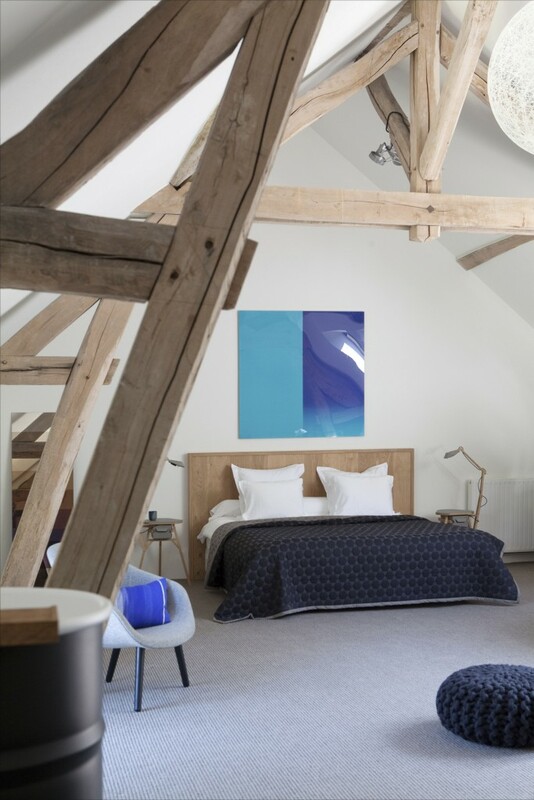 Our B&B contains two rooms and four suites, an outdoor pool, fitness room, sauna, Turkish bath, restaurant and gallery with expositions by predominantly Dutch artists and designers. Burgundy is an amazing region to discover. There is much to do and lots to see, but sometimes you just want nothing for a while. Simply hang by the pool, catch a sauna, read a book. One of the former farm buildings now houses a gym with challenging equipment, a spa with sauna and Turkish bath and in the ‘yard’ a heated outdoor pool can be found. Those who want can get a great massage; in the spa or in their own room. Everywhere around the sophisticated interior art and design can be admired; from the kitchen to the bedrooms, from the entrance to the long hallways. Paintings, sculptures, objects and home accessories hang and stand, as if that is the way it should be, and always has been. The royal suite Fontenay in loft-style is named after one the manor lords’ favourite local historical places. The suite measures some 75m2, and consists of two floors. 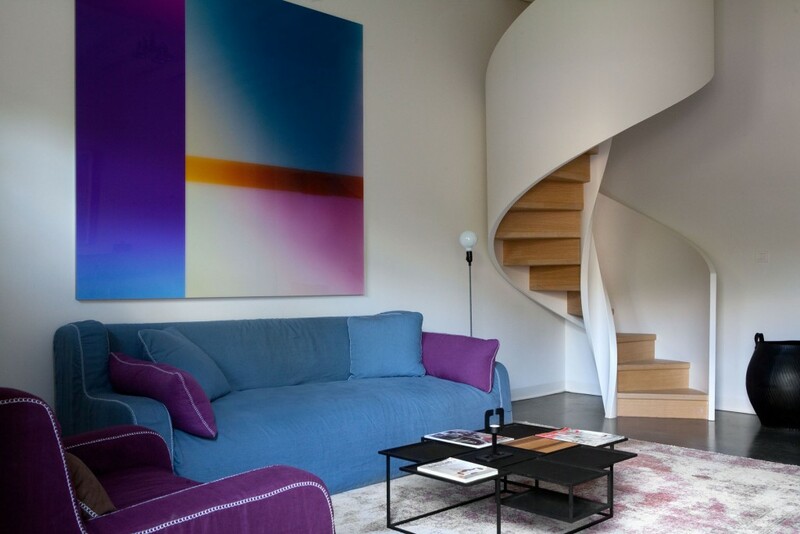 These are connected by spectacular winding wooden stairs, constructed by a Venetian artisan. The living room can be found on the ground floor; the bed- and bathroom are upstairs. The suite has a vista of the former yard with pool. The open bathroom at the top floor has, amongst other things, a freestanding bath, two sinks, a separate shower with rain shower, a toilet and a bidet. 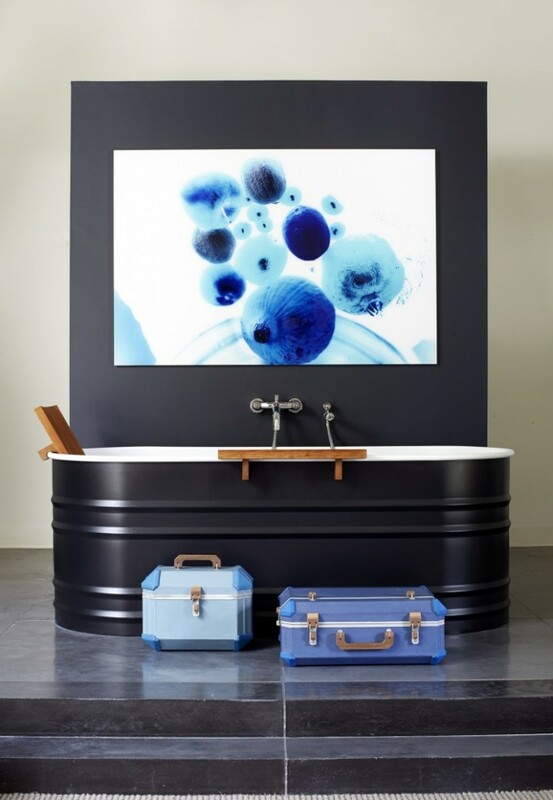 The bath and sinks are a design by Patricia Urquiola for the Italian Agape. The suit- and beauty case, beautifully detailed on the in- and outside, were designed by Jeroen Wand. In all designs around Château de la Resle the link with Burgundy and the castle in Montigny can be found. 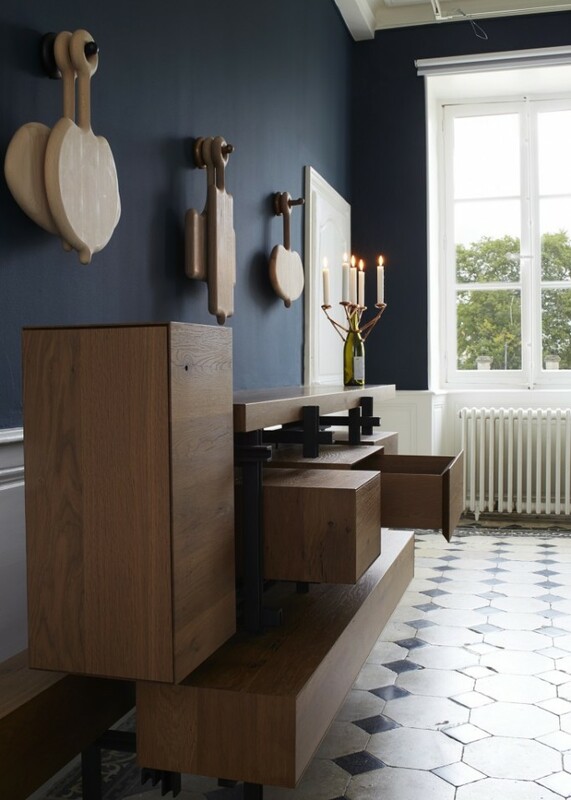 Designer Roderick Vos for example, designed the kitchen of the table d’hôte-restaurant. He also signed for the Montigny dresser, the Saint Germain cutting- and cheese boards as well as the Chablis candle holder. This fits on any bottle of wine and comes in black or copper. The cutting boards on the wall are made from beech wood and can be transformed into a side table using a black steel frame in no-time. The dresser (limited edition) is made from steamed oak with a frame of black coated steel. The lovely tiled floor is authentic.